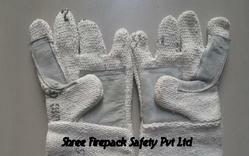 Supplier & Manufacturer of Asbestos Hand Gloves & Asbestos Safety Hand Gloves. Our product range also comprises of Asbestos Yarn, Asbestos Ropes and Asbestos Textile Lagging Ropes. Packaging details: Sizes: 10",12",14", 18",22". We are proud to offer Safety Asbestos Hand Wearing Gloves from our wide gamut of Asbestos Hand Gloves. The gloves are made from superior flannel lining and are required mostly in industries that require the handling of very hot items, as the water proof gloves have a high resistance against temperature. 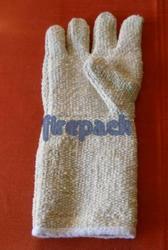 Our adept craftsmen make these gloves in our state-of-the-art facilities. We are leading manufacturer of Asbestos Safety Hand Gloves made up of asbestos cloth, which are used to ensure the safety of the hands of the workers, in industries which involve direct contact of workers with hazardous material. Made from Asbestos cloth (SFI) similar to AMC - 41.